Japanese pianist Chiharu Iinuma has been increasingly in high demand as a teacher, coach and ensemble pianist. A founding member of the Ridge Trio, the Chamber Ensemble Bloomington and the Duo Gillham-Iinuma, for many years she was the studio pianist for Joseph Gingold, Janos Starker, Franco Gulli, Neli Shkolnikova, Tsuyoshi Tsutsumi, Miriam Fried, Yuval Yaron, James Campbell and IU String Academy at Indiana University's Jacobs School. Chiharu has also collaborated at the world's most prestigious music competitions, including the Tchaikovsky and Queen Elizabeth, Leonard Rose Competitions. In 1993, she was invited to participate in the inaugural Isaac Stern Chamber Music Workshop at Carnegie Hall in New York. She has been heard on NHK and CBC radios over the years. In recent years, she has played in concerts and festivals in Germany, Sweden, Scotland, China, Taiwan, Japan, as well as across U.S. and Canada collaborating with Arianna String Quartet, Pendereki String Quartet, Adrian Anantawan, Dale Barltrop, Ariel Barnes, Rachel Barton-Pine, Martin Beaver, James Campbell, Mark Fewer, David Gillham, Tom Landschoot, Blair Lofgren, Antonio Lysy, Johannes Moser, Philippe Muller, Christoph Schickedanz, Alan Stepansky, Tsuyoshi Tsutsumi, Rafael Wallfisch, Rob Weir, Thomas Wiebe, Eric Wilson, Min-Ho Yeh, among others. From 2001 to 2004, she was the Director of Accompanying at the University of Central Arkansas where the Duo Gillham-Iinuma was "Duo in Residence". Chiharu has served as a staff pianist and coach at institutes such as the Meadowmount School of Music, Indiana University Summer String Academy and currently at the Domaine Forget International Music and Dance Academy in Quebec, Canada, where she is also on a faculty for the Collaborative Piano Program. 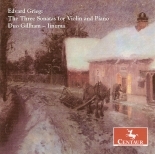 She has recorded "Edvard Grieg: The Three Sonatas for Violin and Piano" with David Gillham for Centaur Records (CRC2873). In 2014, she recorded the complete sonatas by Brahms with German violinist Christoph Schickedanz, and Resphigi/Mendelssohn sonatas with David Gillham in 2015. The discs will soon to be released by the same label. Starting 2016, she is on the project for recording the complete piano/violin sonatas by Beethoven and Mozart with Gillham, under contract with Centaur Records. The project is taking place in Floisdorf, Germany. Chiharu was born in Nagano and raised in Tokyo, Japan. Following her graduation from the Toho Gakuen School of Music in Tokyo, she was awarded the Asahi Beer Arts Foundation Scholarship, which enabled her to study at the Indiana University Jacobs School of Music where she received her Performer Diploma, Artist Diploma and Master’s degree. Her teachers include Yoshimi Tamaki, Shuku Iwasaki, Shigeo Neriki and Leonard Hokanson. Currently, she is on a piano faculty at the Vancouver Academy of Music.